Quick overview The idea of a single divine being - God, Yahweh, Allah - has existed for over 4,000 years. But the history of God is also the history of human struggle. This account of the evolution of belief examines Western society's unerring fidelity to this idea of One God and the many conflicting convictions it engenders. The idea of a single divine being - God, Yahweh, Allah - has existed for over 4,000 years. But the history of God is also the history of human struggle. While Judaism, Islam and Christianity proclaim the goodness of God, organised religion has too often been the catalyst for violence and ineradicable prejudice. 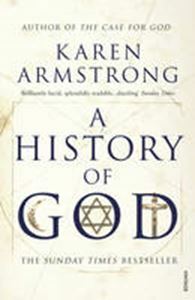 In this fascinating, extensive and original account of the evolution of belief, Karen Armstrong examines Western society's unerring fidelity to this idea of One God and the many conflicting convictions it engenders. A controversial, extraordinary story of worship and war, A History of God confronts the most fundamental fact - or fiction - of our lives.